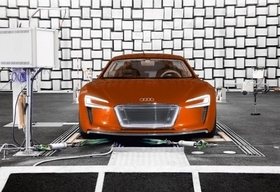 Audi will launch an electric-powered version of the R8 sports car in 2012. Here the car is being tested for sound. Automakers are looking at giving their electric cars futuristic sounds to ensure that the vehicles don't pose a danger to pedestrians who cannot hear them coming. Unlike gasoline or diesel cars, EVs are almost silent when they start and accelerate to cruising speeds. Pedestrian safety lobbyists and organizations for the blind worldwide are campaigning for legislation to ensure EVs are given a unique sound that can be heard by people outside the car. Nissan's Leaf battery powered compact hatchback emits a noise that can be described as a cross between a small jet plane and a monorail. The sound was developed with input from the U.S.-based National Federation for the Blind and the Detroit Institute of Ophthalmology, which Nissan said helped configure the final specifications. However, the development of sound-emitting devices remains at the very early stages, Tom F. Smith, chief marketing manager for the Leaf told Automotive News Europe. “There is going to be a learning curve, no doubt,” Smith said. Audi's acoustics experts are working to create a futuristic engine note for the brand's electric cars and are drawing inspiration from science fiction. The German premium brand is developing a range of electric cars that will be sold under the badge E-tron. Christian Schueller, Audi's head of brand development, said the automaker is avoiding the obvious approach of working with the familiar sound of a combustion engine, because "we want to underscore that an electric or hybrid Audi is an innovative product." Ralf Kunkel, Audi's head of acoustics, said: “The sounds used for space ships in films are reminiscent of car sounds, yet are also very different, making this a rather interesting approach." Audi said its E-tron cars will not sound like a jet airplane or a space ship from a science fiction film any time soon. “But the sound will be new and unusual. The Audi RSQ from the 2004 Hollywood film I, Robot gives an indication of how an Audi might sound in the future,” the company said. “You might think the danger merely involves cars already in motion that are headed in the pedestrian's direction on a road or street, but a vehicle that accelerates from a standstill three or four meters from the pedestrian represents a greater danger since the car makes absolutely no noise then,” he said. Audi's Kunkel said at speeds higher than 25kph (15 mph), electric cars make as much sound as a conventional vehicle because of noise from the rolling of the tires and the slipstream. But electric cars' quietness at lower speeds can feel odd to the driver and be dangerous for pedestrians. The risk is heightened because people use their hearing to monitor all 360 degrees of their surroundings as their eyes only cover a limited angle. People with poorer vision or who are distracted can easily overlook a car. Audi technicians have taken up the task of protecting pedestrians in the electric mobility era and “one way do this is by generating artificial noise in electric cars,” Kunkel said. Renault aims to become Europe's leading seller of EVs, with ambitious plans to sell 200,000 electric vehicles annually by 2015-2016 through a broad product range including the Fluence sedan, Kangoo delivery van, Zoe subcompact hatchback and Twizy microcar. Thierry Koskas, Renault's EV program director, said the company's EVs will not imitate gasoline-powered vehicle sounds. “The noise is not comparable to an engine noise but we don't want it to sound like birds [singing], either,” he said. “It will be something in between."